Unsurprisingly, this major campaign was rolled out two weeks before the release of their quarterly earnings. During the fourth quarter of 2017, revenue was posted at $15.4 billion, a nine percent rise over the previous year according to adage.com. 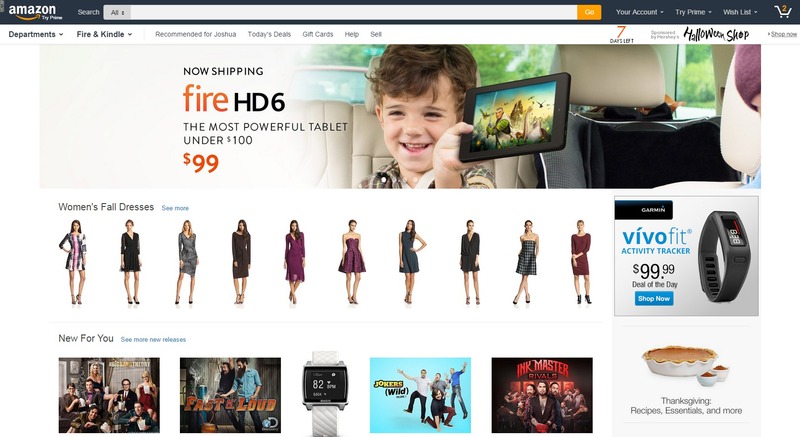 Online sales were also up 18 percent. How will the rebrand affect the earnings in the coming year? Who are they targeting with the rebranding efforts? Let’s take a moment to look over the color psychology, the website redesign, and pull it all together with a few interesting points. 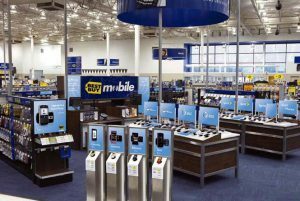 Best Buy’s original branding consisted predominantly of a deeper navy blue and overpowered much of their in store experience. In Joe Hallock’s undergraduate thesis at the University of Washington he collected detailed responses from over 500 participants on the impact of color on word associations like trust. 34% of those participants named the color blue as a representative of trust with 43% listing it as their favorite color — 35% of females and 57% of males. Best Buy’s old logo utilized a blue that was dark. It felt heavy. Sturdy. It’s calming. It slows you down. Their new logo is brighter and highly saturated. What impact does that have on experiencing the brand? Cailin Boyle, author of Color Harmony for the Web, suggested that the use of bright and saturated colors help make a corporate identity fun, accessible, and exciting. Which logo makes you feel more relaxed? Does one give the sense of speed more than the other? Color saturation as a methodology is used frequently in fast food chains. Big bright colors, typically red and yellow, to help trigger excitement and speed. McDonald’s doesn’t want you relaxing in their restaurant. They want you to order your food, eat it quickly, and leave so they can turn the tables and make more profit (note: this has actually begun to change on a smaller scale as they rebrand and soften their interior experiences interestingly enough). Why would Best Buy want to speed up the experience of their customers? A couple of ideas come to mind. Giving the perception of speed through color or motion actually tricks our mind into thinking time is moving faster although it truly isn’t. If you spend 15 minutes in Best Buy with the old color scheme it may feel heavier and slower. A heavier and slower retail experience seems cumbersome. We are lazy as a human race. Our brain is constantly trying to remove road blocks and use less energy to accomplish tasks. Imagine if your brain subconsciously categorized Best Buy as slow and inefficient. You wouldn’t want to shop there any more (this is where Amazon sneaks in by removing these pain points – read my article about that by the way). Best Buy’s rebrand could be an attempt at changing the perception of their retail experience. Funner. Easier. Quicker. More accessible. Their new logo certainly conveys those sentiments, but the in store experience will need to be updated to better reflect those strategies as well. Color, typography, and composition are the first customer touch point in their journey to purchase products. That is short term. The human element of customer interaction with support and sales will either validate, or invalidate, that experience. That second step will define the brand long term. Designers, architects, and musicians may not consciously seek out to follow the Fibonacci sequence, or rule of thirds, but our brain subconsciously finds these patterns for us. These perceived rules help our brain quickly understand, qualify, and categorize what we’re experiencing. I won’t delve into that further here, but if you’re curious about that take a moment to read my article “Great Website Design: The Golden Ratio“. 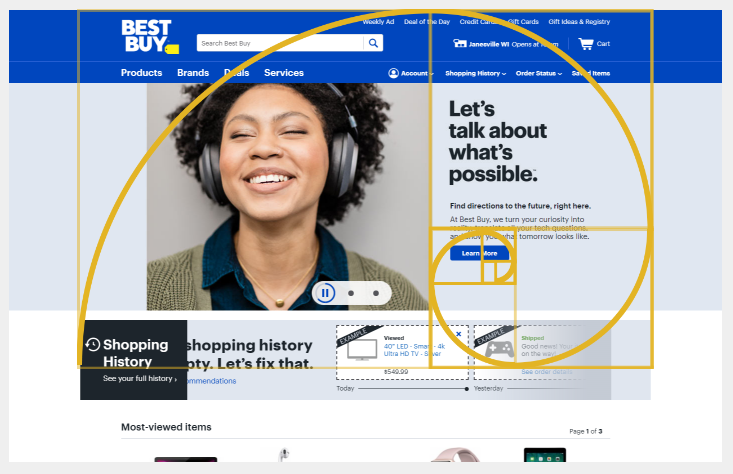 To further iterate how organic this structure is take a look at the above image that was taken from bestbuy.com using UXTriggers. What I found interesting was the structure of the website’s content container when applying the golden ratio (or golden spiral in this instance). The core marketing image is anchored by a happy female. This is the only person visible on the page initially; products aren’t even visible yet. Lining up perfectly to the right of the grid is the messaging: “Let’s talk about what’s possible”. It’s open ended and hopeful. It begins to push a sense of, “I can buy anything I need from Best Buy.” Take a look at how the golden spiral spins directly through that messaging and into the learn more button. Whether that was a happy accident or fully intentional, this page is structured in such a way that it guides us deeper into the website without slowing us down with unnecessary information or design aesthetic. It’s very strategic. Conceptualizing a restrained and subtle experience like this is easy. Obtaining buy-in from stakeholders and implementing it is incredibly difficult. This design was deftly maneuvered. 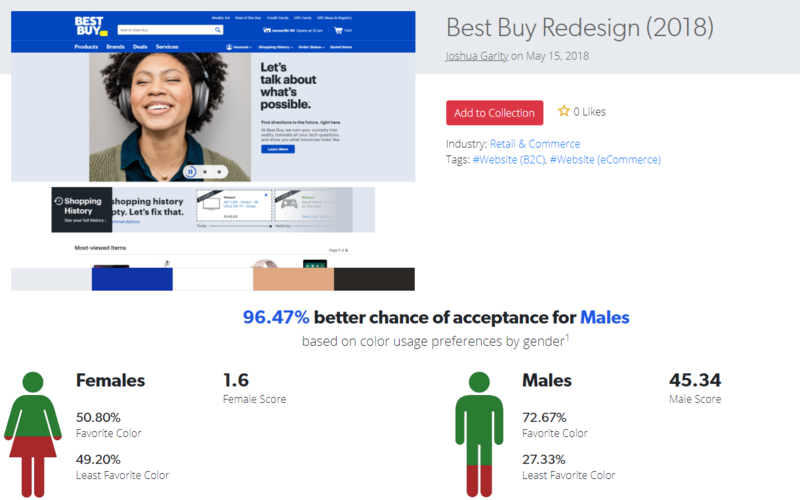 Based on the color palette on bestbuy.com, Best Buy seems to be leaning in heavily toward the male demographic (96.47% better chance of acceptance for males based on the image above). This paired with an oversized, somewhat childish, font gives the impression that Best Buy is designing their online experience around adolescents (12-19) – teenage males to be more specific. Interesting note about the font and how deep the rebranding rabbit hole goes: it’s a custom font called “BB Human Web”. It’s safe to assume this stands for “Best Buy Human” which is intriguing because The New York Times published an article in September 2017 titled “Best Buy’s Secret for Thriving in the Amazon Age” which references tactic #2 being, wait for it, “Focus on humans”. This wasn’t just the author randomly coming up with that either. It was delivered to them by Hubert Joly, Best Buy’s chief executive. Now, back to that home page. The colors and font create a thought-out picture of the ideal customer, but what about the sole image they used? If they are tailoring the experience for younger males why have “Carrie the young urban female” front and center? Where did I even come up with that name? Well, back in 2008, Consumerist leaked Best Buy’s new customer personas and they included Maria (Middle American Female), (Empty Nesters) Helen and Charlie, and…wait for it…Carrie (Young Urban Female). Best Buy is effectively honing in on a very specific market demographic while not alienating an aspirational customer persona. Best Buy has been investing in this rebrand for quite some time. They are generating more revenue and increasing profits. They are forming new partnerships with competitors like Amazon (read more on the partnership). They are on solid ground and that will likely continue to increase the value of their stock and reinvest in their brand experience (digital and in store). 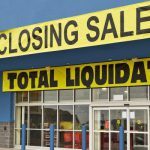 If Sears closes all stores, Best Buy does not have a strong competitor in the physical retail space. 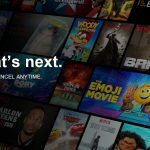 They will own television, computers, general electronics, and appliances as a unified shopping experience. More so, in the last year they’ve increased their stock of toys, figurines, and educational toys (see my article on the toy industry and online retail here). It’s very likely Best Buy will continue to succeed if their leadership continues to value execution on a level like this. It’s long term and detailed. It may not hit everyone’s mark, but it doesn’t need to. It needs to speak to their core customers in a specific way.